In the past few days I've heard news of a new craft shop which opened up in Coventry's Canal Basin last week. I've been messaging back and forth with the shop's owner on Ravelry, who says it's open Wednesdays, Fridays and weekends. The shop's called 'Youpunkeroo' and is aiming to be a sort of workshop, with drop in and do as well as group sessions and classes. She's also starting up an evening crafting group on Thursdays, starting this week. I haven't checked the shop out as of yet, but it's on my to do list. Knitting has been continuing apace, with the Jaywalker sock accompanying me on our trip to the Royal Armouries on Saturday. It didn't get much of an airing though, only coming out so I could knit a row or two in the evening. The first sock is finished and fits. I'm still not 100% happy with it - the ribbed cuff is more decorative than functional for example - but I've decided that it will have to do as I'm not sure I'd have the heart to rip it out and start again. If I did, the Jaywalker may never happen and the yarn would be reknit into a different sock. It is a pretty sock, which is why I've persevered so far, but there are limits to how many times I'm willing to rip out and reknit the same sock. An ongoing theme since Christmas has been Tunisian Crochet, which is what I wanted to write about today. I'm still slowly working my way through the book (Encyclopedia of Tunisian Crochet) Dave bought me and having great fun in the process. I decided that rather than continue crocheting little squares, I'd up the stitch count to 30 and make slightly bigger pieces, which I'll keep and eventually join together to make a blanket. This is by no means a quick project and I'd expect to keep plugging away at it throughout the year as my fancy takes me. I've worked through the standard foundation stitches and skipped the more exotic or unconventional ones. Then I started looking at combining standard crochet stitches with Tunisian foundation stitches. Remembering that the book is written by an American lady, it talks about using Double Crochet with Tunisian foundation stitches. Double crochet (our Treble) is a stalwart of the crochet world and gives a lighter, less dense fabric than is typical of Tunisian foundations. It's executed by forming the Tunisian base row in the normal way, then working forward along the row crocheting through your chosen foundation loop, but doing a DC (tr) rather than a SC (dc) and failing to pull through the last loop (so the stitches accumulate on the hook as normal). The result is a very loose top to the stitches when you do the return row, reminiscent of broomstick crochet/lace - which can distort the work with each successive row. This for example is a sample of alternating rows of Tunisian Simple Stitch (Tss) and Double Crochet Tunisian Simple Stitch (DcTss). I've gone up to a 6mm hook for this in my ever continuing quest to conquer the curl and looking at the fabric I think that's about as big as I should go for the yarn I'm using, which is a superwash wool in DK. The recommended hook size for this would be 4mm, so that's an increase by four sizes! It still doesn't lie flat, but the bigger hook combined with the taller stitches is giving a fabric with more drape to it, so I reckon that if worked into a blanket and after a bit of blocking it might flatten out. Next up, I tried the same thing with a Tunisian knit stitch. 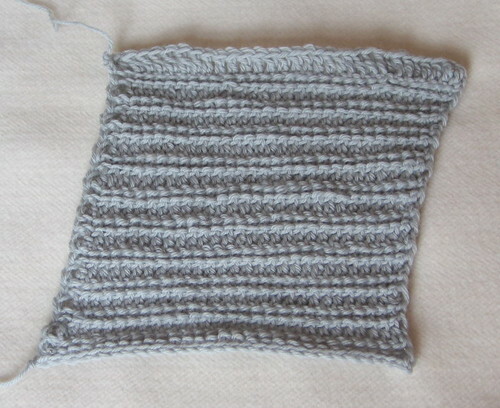 Again, I've alternated rows of Tunisian Knit Stitch (Tks) with Double Crochet Tunisian Knit Stitch (DcTks). The photo doesn't do this justice and it's actually quite pleasing to look at. 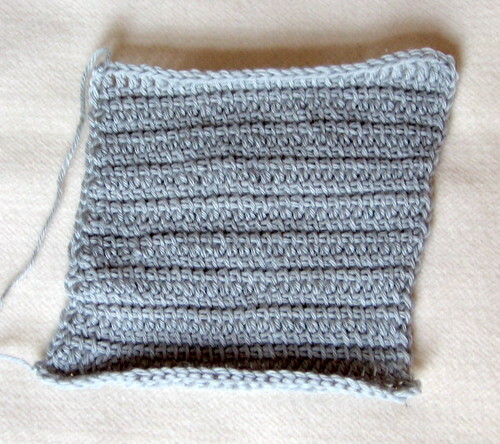 The main problem I had was keeping track of the stitches with this one and I took to counting at the end of each row. Somehow I was regularly managing to decrease which wasn't what I was after at all. What this sample did do was teach me how to read the work which helped no end in spotting where a mistake was once I'd figured out that I must have made one! This one lays flat without any trouble at all. 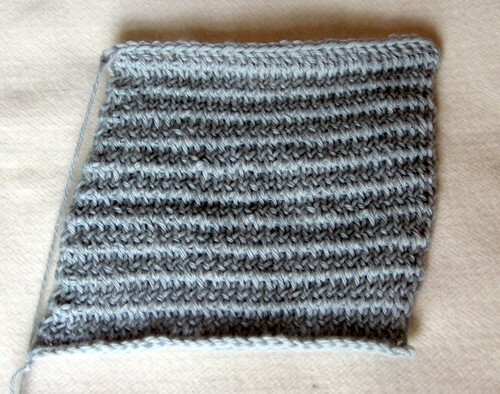 It also ends up with very distinctive rows of purl bumps across the front - not exactly unattractive, but very obvious. With this one, rather than having problems with accidentally decreasing, I was increasing! Working the back loops could be quite difficult on the DcTps row, with the extra stitch height pulling on the previous row and distorting things so it was hard to see where I was supposed to put my hook. Bearing in mind I haven't read how you deliberately increase (or decrease) I think this is something of an accomplishment! From the non yarn workers eye, the middle photo looks the best result.